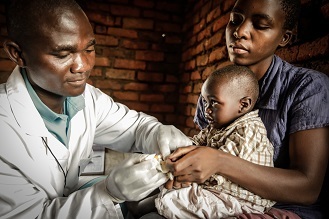 Esther Kantwera is a 32-year old pharmacy assistant student enrolled in the Pharmacy Assistant Training Program. 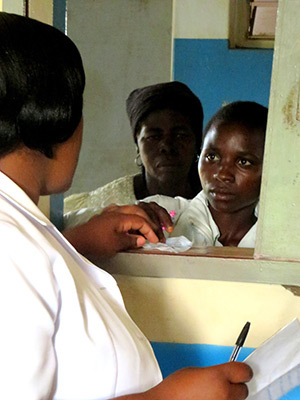 Before becoming a Pharmacy Assistant, Esther worked as a nurse auxiliary (or a nurse’s assistant) for 10 years at Kamuzu Central Hospital in Lilongwe. She decided to go back to school to become a pharmacy assistant to advance her studies and her career. Her favorite part of the Pharmacy Assistant Training Program has been the 10-months she has spent in practicum placements; 5 months at a district hospital and 5 months at a rural health center. She said the practicum has prepared her well for the realities of her job where she faced long lines and up to 350 patients a day, a scenario that she never could have prepared for in the classroom. Through the practicum experience, Esther has learned how to give advice and instructions more efficiently in order to ensure all patients are seen and receive their medication. At her practicum placement, Esther is also responsible for record keeping, organizing the storeroom, and ordering medicines and supplies. Esther takes great pride in organizing medications and supplies so that they are clearly labelled and easy to find (something that was not done well before she came). She has also organized the storeroom to ensure that medicines with nearing expiration dates are dispensed first to avoid wasting valuable medications, which is also a persistent, common issue in most rural pharmacies. 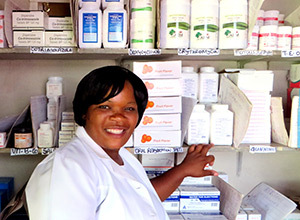 During practicum training, Esther and her cohorts support approximately 11 district hospitals and 25 health centers, making immediate improvements in storeroom management, reporting, and dispensing practices. Esther is one of 150 trainees who will graduate with the first cohort of trainees in April 2015.